Summary: In 2006 – 07, University of Florida Extension Agents servicing St Lucie and Indian River Counties initiated the Sea Turtle Friendly Practices educational campaign. 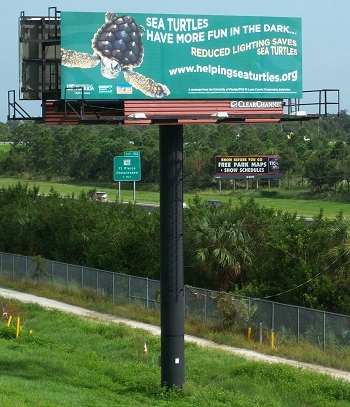 This campaign was financed courtesy of a Sea Turtle Tag Grant, and involved development of educational displays and publications. Environmental education centers, public libraries and other outreach organizations assisted with the dissemination of these educational materials and adopted the use of educational displays designed to teach the public “sea turtle friendly” practices. Featured recommended practices included reducing the effects of artificial lighting, removal/relocation of beach furniture at night, protecting/re-establishing sand dunes, etc. This project will continue this valuable program and to expand it through the use of a one billboard. Educational brochures have already been developed. However, there is a need to reprint color copies of the Turtle Tracks and Turtle Friendly Beaches publications. Table top displays for brochure and publications will be purchased and made available to environmental education providers in St. Lucie and Indian River Counties. Funding will be used to reproduce these publications and to purchase table top displays. Funding is also requested to develop a highway billboard featuring a “Sea Turtle Friendly Beaches” theme. St. Lucie County owns four highway billboards in the right of ways along the Florida Turnpike and I-95. St. Lucie County will commit at least one billboard to the Sea Turtle Friendly Beaches public education campaign. Grant funding will be used to develop the Sea Turtle Friendly Beaches graphics package for the highway billboard vinyl, printing and installation of the campaign vinyl on a highway billboard.